I'm officially on SPRING BREAK for TWO WHOLE WEEKS! My goal is to be posting as much as I can! That is...if I get off the couch and actually wear something. You probably don't want to see me all decked out in some sweats and UGGs. But, I do have some fun things planned these next two weeks that will (hopefully) inspire me to dress up! First, I'll be going to Boston for three days to look at colleges *gulp*. It's hard to believe in 2 years I'll be off to college! I have no clue where I want to go right now, but I do want to be near/in a city, as opposed to the middle of nowhere! Second, I'm going into NYC for a big shopping spree! I can't wait to load up on spring/summer fashions straight from the heart of the Big Apple! Style Tip: This sparkly, floaty dress from Ruttish is super feminine and romantic. In order to avoid the overly girly look, pair with edgier accessories. I paired it with a leather jacket, leopard belt and spiked necklace but wore my ladylike color-blocked heels (don't they look like the Zara ones that EVERY blogger has?!) so that the edginess wasn't over the top. Adore your accessories! The cheetah belt was the perfect touch. Also, those shoes really do look like the Zara ones. Can't believe you scored those at TJ's! Ooooh Rory, could you PLEASE take me with you when you go to NYC? I'd love to go there!! You look gorgeous as usual :) Love the combination of the dress and the belt! Absolutely love the accessories and the jacket! Have you ever been, Marloes? I live more or less an hour away so its super easy for me to go whenever I want! I've actually seen over 15 broadway plays but I've barely shopped there! Totally adorable! Love that leopard belt and that dress! I really enjoy receiving (and reading!) your comments. They are always so positive and completely motivational. Ohh, such an amazing dress! And I love it paired with that jacket! Super belt and great shoes. Love how you incorporated the leopard belt! It was on my must have list a couple weeks ago! Have fun on your trips!! Jealous! What a gorgeous dress! And that necklace is stunning! 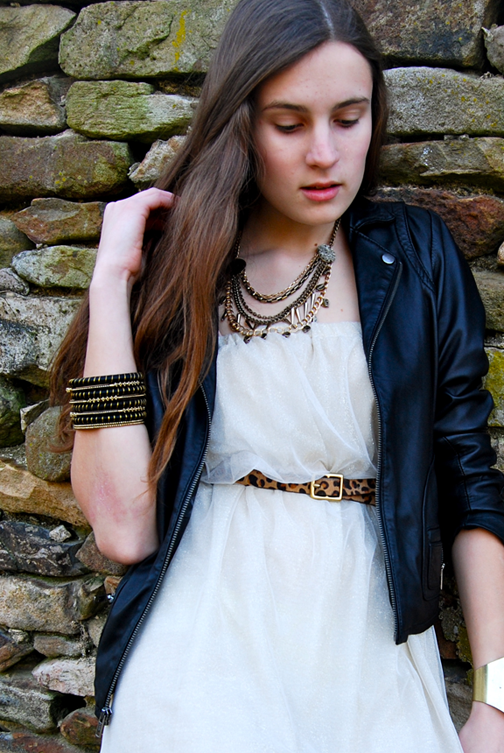 Love the soft dress mixed with the harder edge leather jacket. Plus leopard print is my fav! Cute outfit! I like shoes & cuff. This white dress was awesome! Love your outfit, it's so cute! Great necklace and shoes. Pretty dress, leopard belt is a great touch! um stupid me, its a leather jacket i thought that it was silk. never seen anyone pair a light girly dress with silk sporty jacket and pull it off. you actually make it work. how can you do that seriously??? those shoes are to die for. not to forget that. OMG! I am dying over those shoes, I have laid my eye on them some time ago, I stare at them every time I go to TJMaxx! !